CRAPTASTIC: Five Feature Friday #10, Fall Style! I love Fall people! Love. Love. LOVE! I love the smell, love the decor, and I love sitting on the back porch watching my coffee steam in the crisp air! It is so cool here, yet so bright and sunny! So in honor of the beginning of fall, I've found some of my favortie fall inspired projects! I adore this bright yellow front door makeover from Momma Hen! The yellow will be beautiful through any season, and you can just catch a peek of her fall set-up! You should check it out, it is gorgeous! Don't you just want to sit and relax on Lavender Garden Cottage's porch? The chippy paint on both the floor and the side table are perfect! 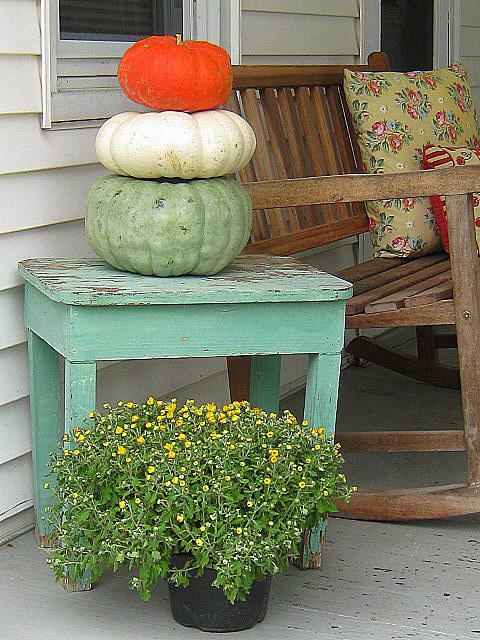 I love the stacked pumpkins! A Thrifted Market shared her many fall decor ideas - I just love this garden set up! The old wagon with the pumpkins and flowers is so welcoming! Lady Crafter 14 made her first ever wreath using materials from her house! The ruffly burlap looks so pretty paired with the colorful rosettes! This door makeover from The Uncluttered Lifestyle may not scream fall, but it screams comforting to me, and that is what fall makes me feel! I bet she smiles every time she walks through this door! I hope you all are enjoying fall as much as I am!! Have a great weekend! Thanks for feauturing me today!! Cute blog girl! Happy Fall! I just read your entire blog! Love it! I feel so inspired after seeing all of your projects! Especially after seeing that even when you were a very busy student you still found the time to work on things. I'm also a student and I have such a hard time using my free time for ANYTHING productive! Craptastic... I just keep saying it over and over and laugh... obviously it doesn't take much to humor me:) Thanks for the feature! Hi Katie. Thanks so much for the feature. And I absolutely smile every single time I want in the door. I adore the color!